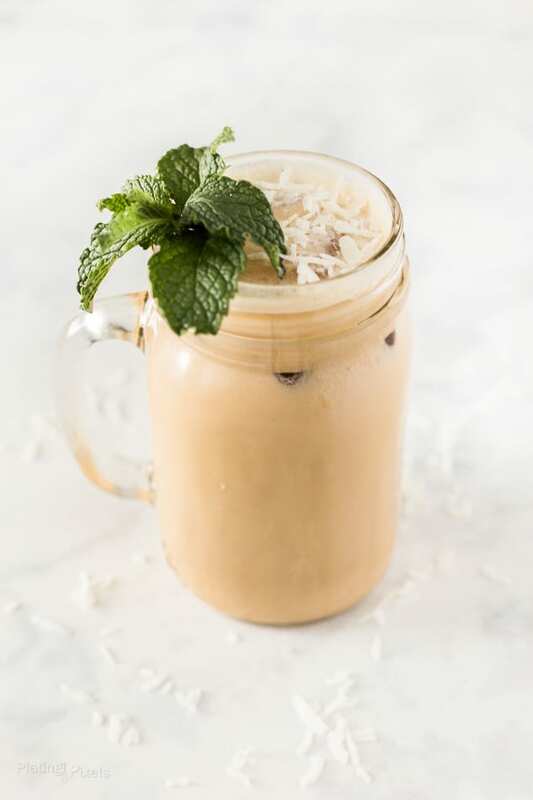 Coconut Mint Iced Latte is an easy homemade specialty coffee drink. Made with cold brew coffee, muddled mint, milk coconut extract and whipped cream. As an iced coffee and cold brew fanatic, there’s now more to love about the warmer weather. While I drink iced coffee year-round, it feels more natural during summer months. I make sure to have some cold brew on hand, and the convenience of always-ready coffee is hard to resist. Start with muddling fresh mint. Mix with chilled coffee or cold brew. 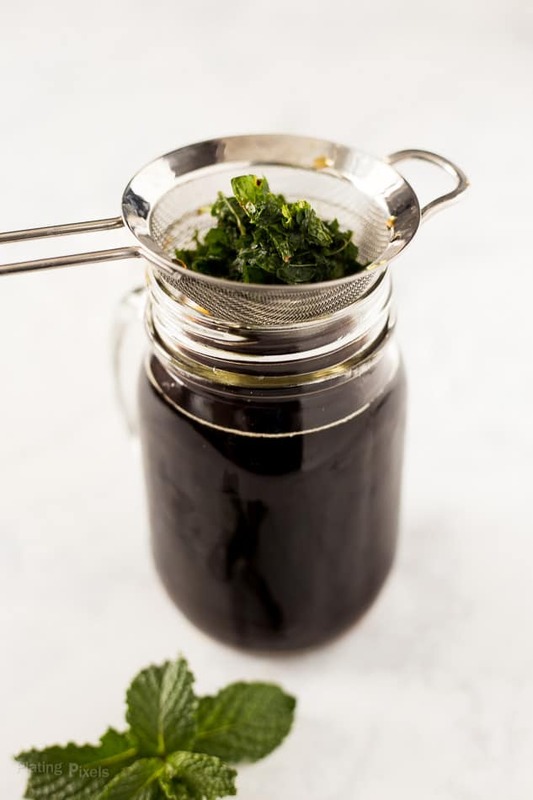 Let the mint infuse a bit or strain right away and discard mint leaves. You’ll still get plenty of flavor. 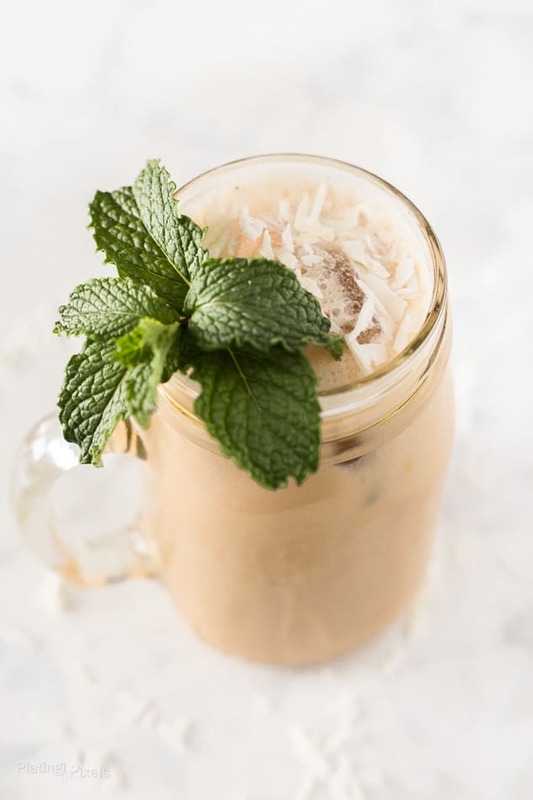 This Iced Caramel Coconut Mint Latte is quick and ready in minutes, with fresh muddled mint leaves. Recently I started an herb garden, which is highly recommended for keeping fresh herbs on hand for cooking, cocktails and drinks like this mint latte. Do you need an espresso machine for iced latte? You can used chilled espresso for an iced latte, but just as easily substitute with strong brewed coffee or cold brew. Flavor profiles: Refreshing mint and coconut with sweet coffee. Texture: Smooth iced coffee with a frothy whipped latte topping. Iced Caramel Coconut Mint Latte made with cold brew coffee, muddled mint, coconut extract and a frothed top. Muddle mint in a glass, reserving one for garnish. Add chilled coffee or cold brew and stir. Add ice cubes. Garnish with whipped cream, coconut flakes, caramel sauce and a sprig of mint. I am legit making this first thing in the morning. I love nothing more than coffee and mint and not necessarily together, until now! Cannot wait for morning! This latte looks so refreshing! I love mint drinks. What a great way to enjoy coffee. This sounds like the perfect way to Enjoy coffee during the warm summer months. Love the mint addition in these. The addition of fresh mint sounds so good with the coconut! This looks delicious. This looks amazing! I love this combination of flavors and I am having some serious coffee envy right now. This looks way better than what I had this morning. Thanks for sharing! I cannot wait to try this.